The best parks in Texas to catch fish for free. 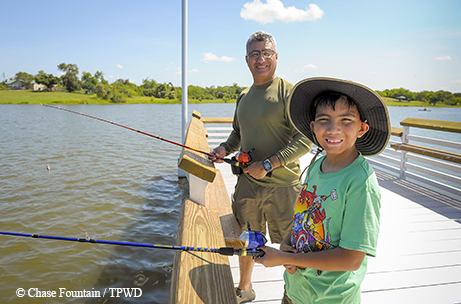 ﻿﻿﻿﻿Happily, you can fish for free (no license required) at any Texas state park. Here are a few parks to cast your line. 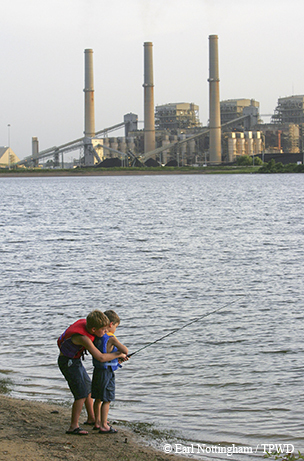 Fairfield Lake is a hot spot for anglers because its water is warmed by a power plant, extending the season. 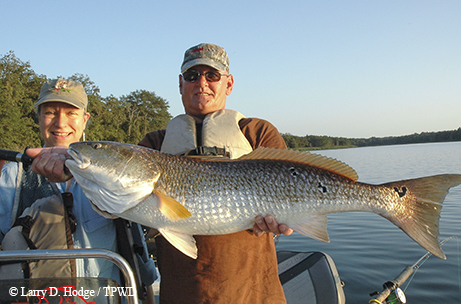 Though it's known for red drum - state record bragging rights at 36.83 pounds and 44 inches - you can also find catfish and largemouth bass here. You have plenty of options when it comes to fishing here: from the shore, wading, from a boat or on the 1,620-foot-long pier. Since it's on the coast, Goose Island features spotted seatrout, black and red drum, sheepshead, hardheads and bull sharks. The 121-pound catfish caught here in 2004 set a world record at the time. Free-flowing current in the Red River makes Texoma one of the few lakes in Texas with a self-sustaining population of striped bass. Smallmouth bass are plentiful too. 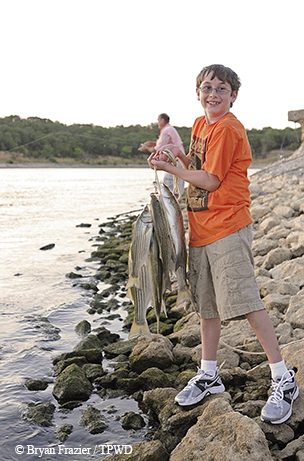 Northeast of Dallas, Cooper Lake features white and hybrid stiped bass, largemouth bass, catfish and crappie. Bank anglers catch crappie on the "wall" at Heron Harbor; trophy flathead catfish are found below the dam when water's released. 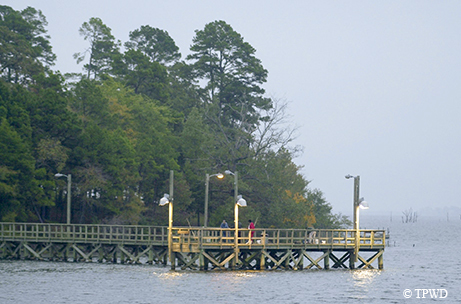 Try your luck with crappie from two lighted piers, including one that's 400 feet long and wheelchair accessible. 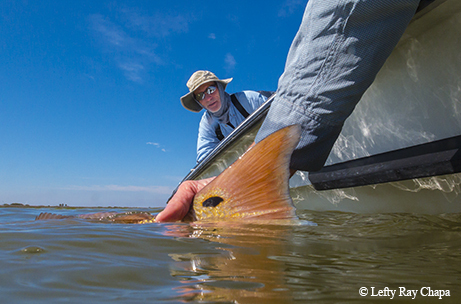 The 20,000-acre lake has lots of 5-pound largemouth bass; the river channel boasts a prime crop of flathead catfish. It's not unusual to catch an 8-pound largemouth bass here in Laredo, just a few minutes from the Mexican border. Crappie, catfish (along the dam) and carp also populate the lake, and hybrid stripers are stocked. Warmed by a nearby power plant, there's plenty of winter and early spring largemouth bass action here. Catfish and crappie are plentiful year-round. Kids can catch sunfish best in late spring/summer. Fish for catfish and crappie at this park on Houston's northeast side. There's free catch-and-release fishing for kids (with adults) in two ponds, and plenty of alligators and welands full of wildlife to see at this 3,000-acre outdoor classroom. Bag trout here during winter stockings (125,000 in 2015). Tip: Check the Texas Parks and Wildlife Department's website in mid-November for this year's stocking dates. 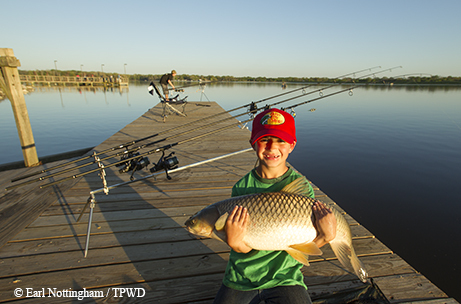 Lake Bob Sandlin visitors also enjoy plentiful white bass, channel catfish, crappie and redear sunfish. When your luck dries up elsewhere in late summer, try the west fishing pier at Purtis Creek for largemouth bass. Channel catfish are stocked annually and grow rapidly, providing an excellent fishery from both piers.